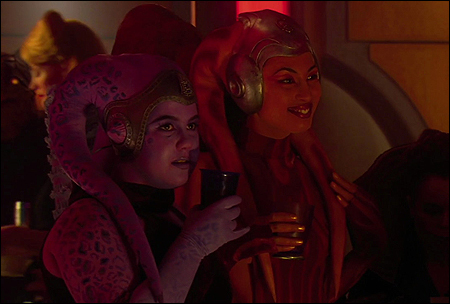 One of the most popular and interesting species in the galaxy is known as the "Twi'lek". Referred to as "tail heads" by some of the clone troopers of the Republic, Twi'leks are born with many different colors of skin (including blue (Rutian), red, yellow, green, orange or even striped), many of whom hail from the planet Ryloth in the Outer Rim. Male and female Twi'leks have many distinct differences. 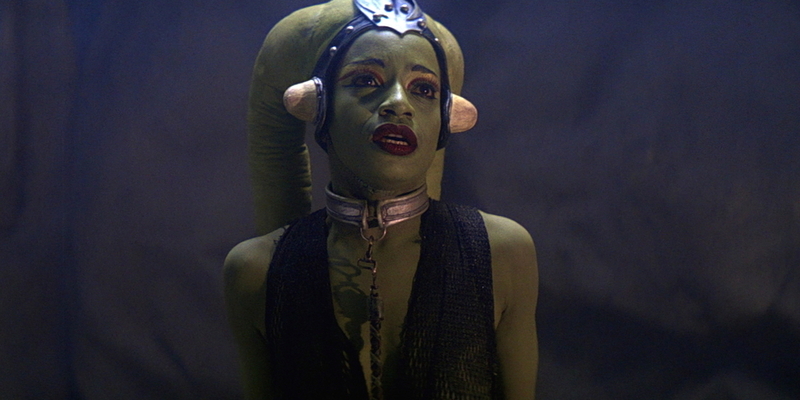 Female Twi'leks have cone-like features where ears would be on a human, while male Twi'leks actually have visible ears on the side of their heads. Male Twi'leks also tend to have more pronounced foreheads. Unfortunately, males are considered to be the dominate gender amongst this species while women took somewhat of a back seat and are many times used as slaves throughout the galaxy. One of the most iconic aspects of these "tail heads" is the features protruding from the posterior side of their head, known as "lekku" or "tchin-tchun" (tchin-right lekku, tchun-left lekku). Lekku are some of the most important parts of being a Twi'lek and they set this species apart from other species in the galaxy. These body parts provide many important uses for the species. Twi'leks use their lekku to communicate with each other (without actually speaking) by arranging them in certain positions (which is very advanced form of communicating). For this reason, unless you're a Twi'lek or an advanced translator droid, deciphering a conversation between Twi-leks communicating using their lekku is nearly impossible. Noteable Twi'leks: Aayla Secura, Bib Fortuna, Hera Syndulla, Cham Syndulla, Numa, Oola, Orn Free Ta, Ayy Vida, Lyn Me. Known for their incredible ability to endure pain, Zabraks are a humanoid alien race which hail from Iridonia in the Mid Rim (however clans do exist on other planets such as Dathomir). The Zabrak clans on Dathomir are referred to as a secondary species as the female nightsisters claimed control of the planet. This war-like species looks very much like humans minus the fact that they have horns on their heads (males and female) which begin to appear during adolescence and they have no facial hair whatsoever (eyebrows, mustaches, beards, etc.). Depending on the subspecies, Zabraks could be bald or have an abundance of hair on their head. Unlike humans, each member of the Zabrak race contained a secondary heart which helped fuel their bodies and keep up significant blood flow. Zabraks are also known for their tattoos which are usually just thin lines on their face as a symbol of their "right of passage". These tattoos can represent many things. For Darth Maul, his black tattoos have Sith significance, but other tattoos may just represent family history or where they came from. 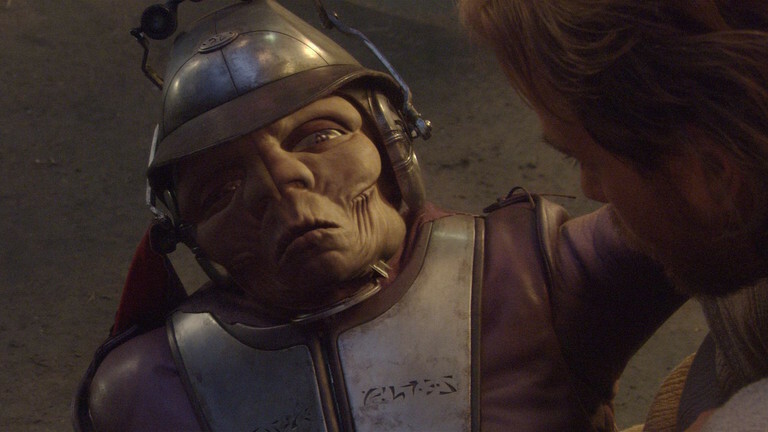 Unlike Twi'leks, Zabraks make terrible slaves due to the fact that they can withstand immense amounts of physical torture. Because the Zabrak people are war-like beings, a big part of their culture is to be able to produce quality weapons. Many collectors throughout the galaxy highly value weapons made from Zabrak hands. Jedi Master Agen Kolar (who fought during the time of the Clone Wars) was able to fit three different colored crystals in his lightsaber due to his knowledge of creating quality weapons and he could chose which color to utilize. Native to the planet Quermia, most Quermians are over eight and a half feet tall when standing upright. They have long necks and two brains (one in the head and one in the chest). The brain in the head controls body functions and emotions while the brain in the chest controls creative thinking. As you see from the photo above, Quermians do not have a nose, but use olfactory glands located in their hands for smelling. Quermians are very closely related to a species known as the "Xexto". Gasagano, a podracer from the Boonta Eve Classic, in Star Wars Episode I: The Phantom Menace is a Xexto. Xexto have four arms and are relatively small. Quermians look almost identical to their ancestors on a much larger scale. Although Quermians have fewer digits on each of their appendages, like the Xexto, they have four arms. Quermians tended to hide the fact they had an extra part of arms underneath their robes while their "parent species" tended to reveal their second pair of arms. In the Mid Rim lies a planet known as Zolan. Residing on this world are the extremely fascinating Clawdites. Clawdites are humanoid reptilians that have the ability to change their appearance by shape-changing into another species of a similar size. As this species ages, their ability to alter their appearance is greatly enhanced. As long as clothing, jewelry and accessories are being worn close to the skin, these items will also transfer when a Clawdite changes form. As shown in Clone Wars Season 2, Clawdites touch the being they want to change into in order to transform into another species. Although the exact scientific facts on how they change form is still unknown, it is believed that the ability to modify or expel water is a main proponent as most beings are composed of water. Changing form causes a great deal of discomfort for Clawdites, but with practice and concentration, an experienced Clawdite can work past the pain to remain disguised. The more they try to alter their mass, the more painful the process becomes. If a Clawdite is killed or distracted while in the form of another species, their body will return to it's natural state. Located in the Expansion Region of the galaxy is the planet, Shili. Shili is the homeworld of the red and white skinned Togrutas. Shili's landscape is filled with turu-grass that grows higher than knee-hight. The grass is mixture of red and white which is a great way for the Togruta people to blend in with the planet. This species feels a special bond with the planet they inhabit and if possible, enjoy walking around without footwear. Togrutas enjoy feasting on smaller rodent-like creatures while they are still living. It's commonly believed that Togrutas are poisonous due to the fact that they have sharp teeth and the rodents they eat spasm during consumption. This is false, but the Togruta people don't see any benefit in correcting this assumption. These aliens are quiet and tranquil beings that have horns called "montrals". These montrals are hollow and help the species sense space ultrasonically. Togruta warriors who master their connection with their montrals feel at home when fighting amongst a crowd. Ahsoka Tano can even sense up to 82 feet using echolocation through her montrals.